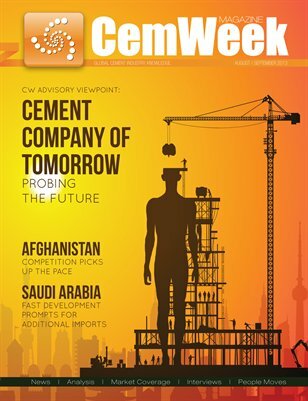 CW Group announces the release of a new issue of CemWeek Magazine – the executive oriented, industry standard source of knowledge and features for the global cement industry. In the opening feature, we take a step back (or a leap forward?) to the future and examine what our consulting colleagues on the CW Advisory side consider as a possible future avenue for the cement company of tomorrow. We then return to the present with a feature rooted in the current situation of Afghanistan, as CW analysts paint a detailed image of the local cement industry, integrating it into the country’s wider economical and political context. The third feature of CemWeek Magazine takes us to an exciting region in the cement trading space: Saudi Arabia, where cement industry runs full throttle and where we take a look into the whys of the cement import rush decreed by King Abdullah and enforced by the local government.